• Commentaries - the following two audio commentaries were also included on Criterion's 2005 DVD release of Jules and Jim. 1. Truffaut's Collaborators - featuring director Francois Truffaut's long-time collaborator Suzanne Schiffman, co-writer Jean Gruault, and editor Claudine Bouche. Also included are comments by professor Annette Insdorf. The commentary was recorded exclusively for Criterion in 1992. 2. Jeanne Moreau - this audio commentary with the legendary actress was conducted by critic Serge Toubiana. It was recorded in 2000. In French, with optional English subtitles. 1. Truffaut on Roche - in this video excerpt from the French program Bibliotheque de poche, director Francois Truffaut discusses Henri-Pierre Roche's novel Jules and Jim. The program was directed by Yannick Bellon and aired on October 12, 1966. In French, with optional English subtitles. (8 min, 1080i). 2. The Key to "Jules and Jim" - an excerpt from Thomas Honickel's documentary Jules and Jim (1985), which focuses on the lives of Helen and Franz Hessel and Henri-Pierre Roche, whose relationships inspired Francois Truffaut's film. In German, with optional English subtitles. (32 min, 1080i). • Truffaut on Truffaut - five interviews with Francois Truffaut in which he discusses his directing methods and the production history and structure of Jules and Jim. One of the interviews also includes comments from Jeanne Moreau and Jean Renoir, and in another professor Annette Insdorf translates the answers given by the French director. In French, with optional English subtitles. 1. Cineaste de notre temps (1965) (9 min, 1080i). 2. L'invite du dimanche (1969) (33 min, 1080i). 3. Truffaut and Roud (1977) (10 min, 1080i). 4. AFI's Dialogue on Film (1979) (29 min, 1080i). 5. Truffaut and Philippe (1980) (29 min, 1080i). • Raoul Coutard - in this video interview, legendary cinematographer Raoul Coutard, who worked with many of the greatest French New Wave directors, discusses his collaboration with Francois Truffaut on Jules and Jim. The interview was conducted exclusively for Criterion in Paris in 2003. In French, with optional English subtitles. (20 min, 1080i). • Jean Gruault - this video interview with Jules and Jim co-writer Jean Gruault was conducted in April 1986 at the Cinematheque francaise in Paris for Rainer Gansera's documentary Working with Truffaut, produced by Westdeutscher Rundfunk in Cologne. However, only a few minutes of the interview were used in the film. Later on, Criterion gained access to the interview, which is presented here in its entirety. In French, with optional English subtitles. (21 min, 1080i). • Robert Stam and Dudley Andrew - in this video conversation, film scholars Robert Stam and Dudley Andrew discuss the unique qualities of Francois Truffaut's Jules and Jim. The conversation was filmed exclusively for Criterion in 2004. (24 min, 1080i). 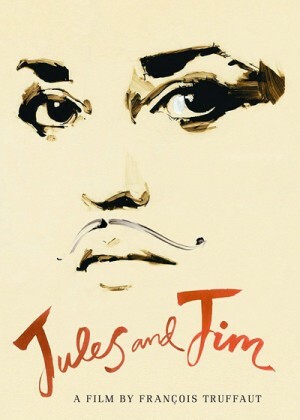 • Trailer - original trailer for Jim and Jules. In French, with optional English subtitles. (4 min, 1080i).